Have you heard the word ‘adenosine’ as it relates to your morning cup of coffee, but you’re not sure what it really means? You know it has something to do with how caffeine makes you feel more awake, but beyond that, maybe the science alludes you. We’re going to break down what adenosine is, its relationship with caffeine, and how it can impact your sleep. Adenosine is one of the body’s more powerful molecules and is linked to the digestion process. During digestion, the glucose in the foods we eat breaks down into glycolysis. This breaks down further into Adenosine Tri-Phosphate (ATP). This is responsible for energy transference between cells. After ATP is “used up”, it decomposes yet again into adenosine. As adenosine builds up in the bloodstream, it interacts with specific cell receptors, inhibiting neural activity and causing drowsiness. What does this actually mean? Well, when the body runs out of fuel in the form of easily digestible sugars from the food we eat, adenosine signals the body to become drowsy. This essentially tells us to sleep and rebuild our energy reserves. It’s a critical chain reaction that initiates the early stages of non-REM sleep and is essential to the natural sleep cycle. How does adenosine relate to caffeine? Caffeine is considered an adenosine blocker. It comes into play by similarly attaching itself to the same receptors that adenosine would normally latch onto. In turn, it prevents the drowsiness that occurs as the levels of adenosine in the body increase. Caffeine, found in drinks like coffee and even some foods, offers a feeling of wakefulness and alertness. Once caffeine levels wear off, adenosine kicks back in to cause a decrease in neural activity in the brain and corresponding drowsiness. 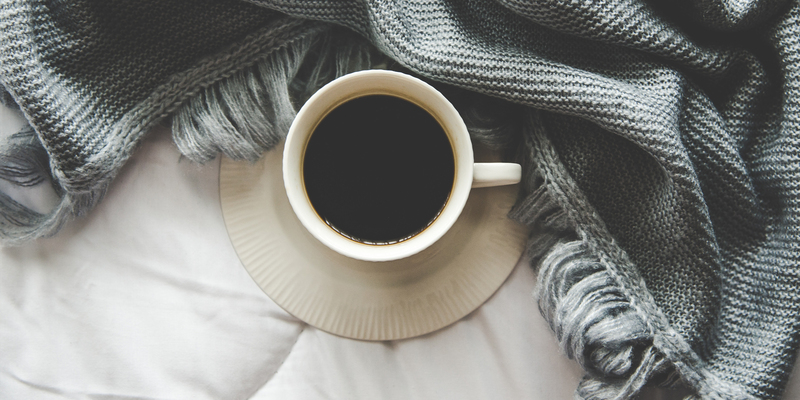 How do caffeine and adenosine affect my sleep? The urge to grab that cup of Joe each morning is typical since many people experience a post-sleep grogginess. This grogginess may be attributed to an excessive build of up of adenosine levels during waking hours that does not fully dissipate during the standard sleep cycle. The accumulation of adenosine in the body is related to the quantity of caffeine consumed during the day. By drinking beverages with high levels of caffeine, the body builds up an excessive amount of adenosine. Often this excess is not fully flushed from the body during sleep. This surplus of adenosine, therefore, contributes to the grogginess many suffer each morning. This feeling encourages people to load up on more caffeine. And on and on it goes! It’s a vicious cycle that results in poorer sleep and lackluster wakefulness during the day. Due to this reaction, too much caffeine, especially over long periods, can wreak havoc on the natural sleep cycle. Experts recommend avoiding caffeine consumption late in the day, as it blocks the normal process of adenosine. Having a late-in-the-day caffeine boost can force the body to remain awake when it should be winding down. To avoid this, doctors recommend halting caffeine consumption after 2pm, and that no more than 2-3 units (equivalent to a 2-3 cups of coffee) be ingested on any given day. We encourage individuals to speak with their doctor or healthcare provider for more information on the topic and work towards finding a happy medium between their desire to dream and that enjoyable double espresso. Who’s the Greatest Snorer of All?